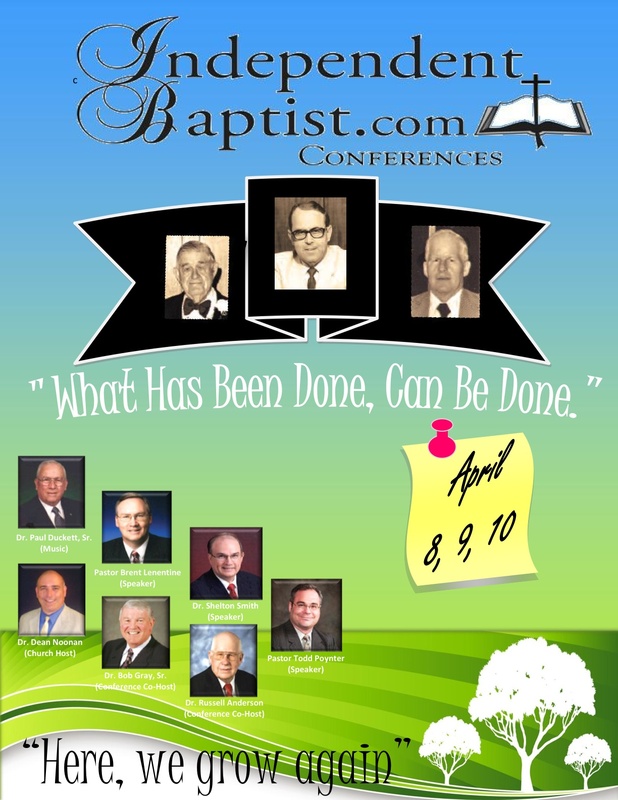 This coming April the INDEPENDENT BAPTIST CONFERENCE will be coming to the Milwaukee area. There will be old fashioned singing led by Dr. Paul Duckett Sr. who led singing and sang for J. Frank Norris one of the fathers of the independent Baptist movement. You will want to spend time with this great man. He has so much to share about the independent Baptist history you have read in books. His music is spirit-filled and you will be talking about it for months to come. There will be classes Tuesday morning beginning at 9 am with men like Dr. Russell Anderson. He has so much to share with our laymen. He came from the coal mines of Kentucky to the multimillionaire who ran 7 businesses and gave 39 million dollars to independent Baptist works including 8 million dollars in one day. Bring your laymen for they must learn his Bible principles that worked and will work. Behind every great revival you will find a great man of God and behind that same man of God you will find a great layman of God! There will be classes for ladies and youth also on Tuesday morning at 9 am. I will be teaching the pastors and staff at 9 am. I will have free materials for them. There will also be a free luncheon on Tuesday at noon hosted by Dr. Russell Anderson with testimonies from laymen who have successfully followed the principles of Dr. Anderson. My son Bob shared with me that there are at least 14 businesses that have been started at LONGVIEW BAPTIST TEMPLE because of his influence. Please do not forget the first 50 pastors who pre-register by calling 414-301-9319 will receive free motel accommodations for Monday and Tuesday. This conference is free but the help will be worth a million dollars to you and your ministry. GOTTA LOVE THE OLD TIME RELIGION! WHAT HAS BEEN DONE CAN BE DONE!